As we approach the UEFA Champions first leg tie between Internazionale Milano and Chelsea, let’s take a look at Senhor José Mourinho. You will learn about his formative years, his brief playing career, teaching background, managers who influenced him, along with his experiences at Sporting Clube de Portugal, Benfica, FC Barcelona, FC Porto, Chelsea FC and F.C. Internazionale Milano. I have added a few quotes from Mr. Mourinho that may show a different side to his public persona. José Mário dos Santos Félix Mourinho, affectionately known as “Ze” to family and friends, was born in Setubal, Portugal in 1963. His father, Felix, was a professional goalkeeper who later became a manager of several Portuguese clubs. His mother, Maria Julia, taught primary school. According to his father, Felix, Mourinho’s affinity, aptitude and acute attention to detail for football management began very early. He worked as a Physical Education teacher at local Lisbon schools. He earned coaching badges and became the youth team manager at Vitoria Setubal, and then an assistant coach at Estrela da Amadora. During his efforts to increase his coaching knowledge, Mourinho was noticed by a prominent figure in world football. “The Englishman quickly understood that Mourinho was more than simply a translator and asked him to watch forthcoming opponents. Mourinho stayed three years at Barcelona where his attention to detail and personal touch were noted by players such as Laurent Blanc and Josep “Pep” Guardiola. 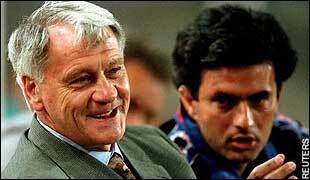 He turned down Mr. Robson’s offer to be his second in command at Newcastle United. He returned to Portugal in 2000 for his first head coaching job with Benfica. His spell with the iconic Portuguese club was rather short. He departed for Uniao de Leiria in January 2001. A year later, he arrived at the club that would launch him onto the world stage: FC Porto. He won everything at his disposal in two years at Porto: The Portuguese Cup and SuperCup, two Portuguese League titles, the UEFA Cup in 2003 and the UEFA Champions League in 2004. At Chelsea, Mourinho continued his winning ways. He won the Premiership twice on the trot in his first two seasons. He could not replicate the European success of Porto. Mourinho left his position early in the 2007/2008 season. He won the Community Shield, the League and League Cup twice, and the FA Cup. His off-pitch verbal sparring sessions with other managers, notably Rafael Benitez, Sir Alex Ferguson and Arsene Wenger, reinforced the notion that Mourinho left no detail uncovered. For Mourinho, the game is played off the pitch as much as on it. Mourinho arrived on the Italian peninsula to manage Inter Milan in 2008, and learned Italian during his break from football. He won the Serie A Scudetto easily on his first attempt and the Italian SuperCup. Similar to his spell with Chelsea, Mourinho has yet to achieve European glory. Reminiscent of his time at Stamford Bridge, Mourinho has gotten under the skin of many opposing managers, journalists and players. “The Special One attacked the Tinkerman’s achievements, ridiculed him for not speaking English fluently and labelling him ‘a 70-year-old.’ As he prepared Juventus for the game against reigning Italian champions Inter, Ranieri insisted he has nothing to envy about Mourinho. Ranieri said: ‘Do I like anything about him? Yes, the fact that all his players speak highly of him, as it means that he manages to forge a great rapport with them. But I don’t like the way he stirs up controversies from time to time. Our frictions have nothing to do with the fact that he replaced me at Chelsea.’I knew I was on borrowed time but I believe I still had a superb season – managing to lift the Blues into fourth place without spending any money.’ Mourinho recently boasted to the Italian media that he earned £11.5million a year. ‘Am I envious of him? Not at all,’ said the 57-year-old Ranieri (not 70) with his trademark smile. Over to Mourinho: “I studied Italian five hours a day for many months to ensure I could communicate with the players, media and fans,” he said. During a Coppa Italia (Italian Cup) match against Fiorentina earlier this month, Mourinho immediately removed rising Inter star, Mario Balotelli, from the match after an incident. Balotelli lost a contact lens, stayed on the ground to retrieve it, and did not run back into his defensive end when Fiorentina attacked. Balotelli refused to acknowledge Mourinho and went straight to the changing room. Mourinho has not lost at home in all League competitions since February 2002 with Porto. At the time of this writing, his sides have won 129 straight league home matches. According to Soccerbase, here are his career statistics: (Wins, Losses and Draws). According to Wikipedia, here is his entire management record: (Wins, Draws and Losses). Mourinho is eager to replace Roy Hodgson after England’s matches in Euro 2016; whether the role will be his, remains to be seen. (1) “Destined to Be Great from the Age of 10,” Sunday Mirror, Sept.12, 2004 by Paul Smith. (3-4,6-7,10) “The Big Feature: Jose’ Mourinho, The Times of London, May 9, 2004 by Ian Hawkey. (5,14) “Man of the Year.” New Statesman, Dec.19, 2005 by Jason Cowley. (8) “The Special One: Jose’ Mourinho YouTube Video. (9a) “Former Chelsea Bosses Mourinho and Ranieri Come Face to Face in Italian Job,” The Daily Guardian, Nov. 20, 2008 by Christopher Davies. (11) “Mourinho Plays Down Balotelli Spat,” AFP, Feb. 6, 2010. Steve Amoia writes the World Football Commentaries blog. He has been a contributor at Soccerlens since 2007. Since 2005, he has published articles, commentaries, interviews, and translations for AC Cugini Scuola Calcio, Football Media (UK), the International Herald Tribune 2006 World Cup Fan Blog, Italiansrus.com, Keeper Skool (Australia), and Soccerlens (UK). “Questa è una vittoria che può significare tanto oppure niente, dipende dalla seconda partita – ha spiegato -. Abbiamo giocato il primo tempo e siamo davanti, ma ora dovremo andare a Stamford Bridge, il Chelsea avra le sue ambizioni, noi avremo le nostre. Sono più ottimista adesso che ad inizio partita, perché ora siamo davanti noi”. “Il Chelsea reclama per un rigore su Kalou al termine del primo tempo, e José Mourinho di fronte alle immagini tv è sincero: “Dico che se il fallo fosse stato nella mia area, mi sarebbe piaciuto che l’arbitro avesse dato il penalty. Rigore? Sì – ha aggiunto il tecnico portoghese – L’Italia non mi cambia, sono onesto e rimango onesto”. Jose Mourinho is one of the best complete coaches I’ve ever seen on planet.He’s good both with the players and the Press.his style of play is highly respected by all soccer lovers especially his fellow coaches.I, as an African love you Mourinho.